I confess to something very un-American. Or since it’s me, would that be un-Asian American? Un-Filipino American? This week on the day after the attacks on Brussels, for the first time ever, I really did feel a bit of fear. It wasn’t the full blown Donald Trump/Ted Cruz fear of all things Islam–including our innocent neighbors. No, I want nothing to do with their xenophobia, and actually do fear both Trump and Cruz as possible presidents of these United States more than I do an act of terrorism. Seeing their responses to the attacks, Trump’s advocacy of torture, and Cruz talking of vigilante patrols essentially to profile Muslims, makes me scared. But alas, I do confess that for a second, I wondered if I really should be flying the very next day as scheduled from San Francisco to New York City? The day after Brussels, a major airport is either the safest place or the most dangerous place to be. As I drove to the airport, I thought for a second that God had made my decision easier when a blizzard in Denver cancelled my SFO-NYC flight and that lame Southwest Airlines couldn’t get me on another plane until Thursday. But it was American (naturally) to the rescue. Get me to NYC by Wednesday night? Are you kidding? Weather and terrorists be damned! And, of course, in the new upsell economics of airlines, it only cost me an extra $500! Surprisingly, everything was remarkably normal. Travelers were all in their respective bubbles. People spoke to their travel mates but not outside that. You spoke when spoken to. You simply went about your business. I did notice an older white woman looking suspiciously at me as I queued up behind her, and it wasn’t like she was wondering if I were the second coming of Don Ho. Maybe she was wondering how I, a certain brown person, even with my noticeable absence of facial hair, got TSA PreCheck? Like I said, just a normal day at the airport. 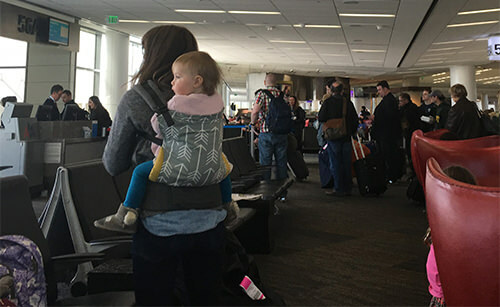 I also saw families traveling with kids, mothers with young infants and toddlers innocently playing while waiting for their flight. They are now living with something I never did when I flew with my kids a generation ago. This is modern life until further notice. And keep your shoes on in PreCheck. Being in the air is probably the safest place to be in the world on the day after. Just me with a few dozen strangers, an unidentified federal marshal, and a little turbulence. I sat in a row of Asian Americans, three across. There was a tech-savvy South Asian man who hugged a black laptop bag a little too much for my taste perhaps. A young Korean woman who was reading about the White House. And me, listening to an old podcast of Mike Daisey’s “Dreaming of Rob Ford,” in honor of the recent passing of the former Toronto mayor. We noticed one another, but never spoke. Our travelers’ bubbles remained intact. I just didn’t find much small talk after Brussels. Maybe because I had newspapers (remember those? ), it did seem like I was thinking about Brussels more than others. I mean, after the Paris attacks, people practically draped themselves in French flags, at least on Facebook. After Brussels, did people go to I-Hop in solidarity? When I was a teenager, I visited Brussels as a member of the Experiment in International Living. Of course, it was just for a few days before I went on to Paris and saw the Eiffel Tower and the Champs-Elysees for the first time. But whereas Paris seemed ready-made for tourists, Brussels always seemed like the generic Europe to me. A working timepiece. The Belge put the Flem in Flanders. And you definitely know you aren’t in America. When the Paris strikes hit, it was easy to recall one’s personal memory of the Tour D’Eiffel. World travelers know Brussels is known for the Manneken Pis (little pee man in Flemish), a 24-inch bronze statue near the Grand Place that everyone visits whenever they’re in Brussels. It is Brussels’ Golden Gate Bridge. He’s a sassy lad that Manneken Pis, with legends attached to his existence, mostly tributes to a playful sense of youthful defiance. As I flew on the day after, I couldn’t help thinking of the statue as part of my European memories of Brussels. Not only did it make me smile, it captured how I felt about all the irrational, crippling thoughts that creep in when an attack occurs. We live our lives, and let our wise leaders respond responsibly. But like the bronze statue, we should douse all the fears, and the xenophobic demagogues too.